Step outside the box with us and create a custom nursery that is unique to you and your little one with help of our Design Gurus. Shop 76thandnewbury.com today and find an extensive selection of beautiful nursery prints and wall art - all of them ready for your own unique, customized style and ready to hang in your son or daughter’s nursery. Skip the usual big box store offerings and instead create a nursery that is as personal as it is inviting. Choose from eclectic styles or more traditional offerings. Or, mix and match to create a range of styles to add some flair to your little one’s room. The choice is yours! 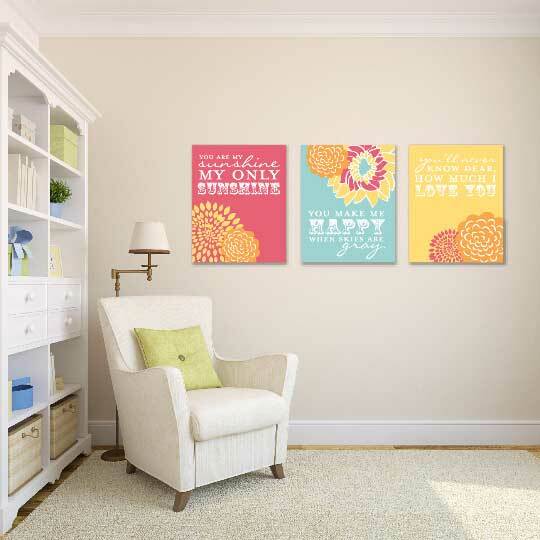 To order, simply contact us today and we’ll pair you with a dedicated Design Guru who can help you to design the ideal assortment of nursery prints, wall art items, and more. And, we won’t stop revising your order until you feel that it is perfect. With free shipping to anywhere in the US for order over $70, you simply cannot go wrong when you partner with 76thandnewbury.com! All Nursery Print orders include a personalized process complete with a dedicated Design Guru and unlimited revisions. Learn more.